Arahmaiani’s Lingga-yoni is an iteration of a work first shown in a solo exhibition in Jakarta in 1993 and features a provocative intermingling of text and image. 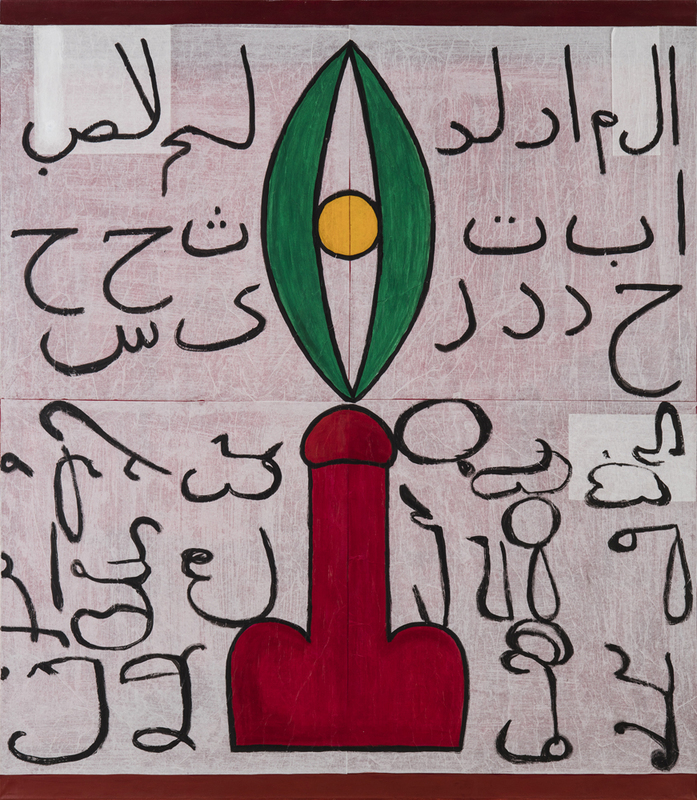 By combining Jawi script (an Arabic-Malay script used for Koranic text) with the imagery of the lingga-yoni (a symbol of cosmic copulation in Hinduism) the artist makes a statement against sexual and religious intolerance, in the context of rising Islamic fundamentalism in contemporary Indonesia, home to the largest Muslim population in the world today. In addition to the Jawi script, there is a reference to Purnawarman, king of the fifth-century Hindu-Javanese kingdom of Taruma. The inclusion of this text, which reads “Nature is Book,” in the Sanskrit language and Pallava script, expresses Arahmaiani’s interest in excavating Java’s pre-Islamic history. While the lingga-yoni form appears to be subversive because of its literal and inverted representation, its precedent can be found at the fifteenth-century Candi Sukuh temple, representative of the last phase of Hindu temple construction in Java prior to widespread conversion to Islam in the sixteenth century.